During the hectic week before finals, the Yeshivah of Flatbush held a moot court competition where students competed against each other in classic law setup. The competition started when captains (Michael Shalom, Daniel Cohen and Bob Husni) handed out prewritten cases that students would argue, either as defendants or plaintiffs. They were then scored on their performance in reasoning, legal accuracy and presentation skills. 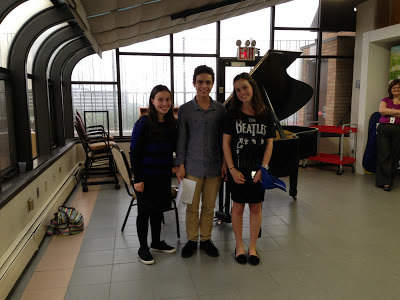 The grand prize went to Albert Mishaan, Isaac Dayan and Morris Bijou, while the runner ups were Rachel Linfield, Binyamin Abramowitz and Nathan Haddad. The sixty students who participated learned about business law and negligence, which was this year’s topic. Special thanks to Mrs. Zerykier, who coordinated the competition and ensured its success, and to the senior judges that took the time to study the cases and judge each one carefully. This year’s competition was a blast, and hopefully next year’s will be even better. 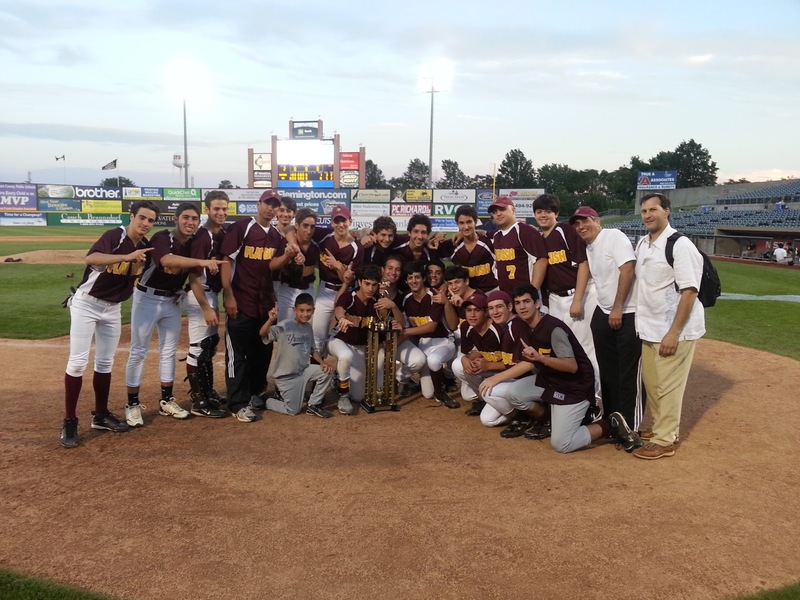 Boys Baseball Team Wins Championship! Congratulations to our Boys Baseball team on their Championship Win against SAR!! In an incredibly close contest, our baseball team outlasted SAR by a score of 1-0 to win the Championship Game. MVP Ralph Navarro hurled a complete game shutout, escaping many perilous situations with grit and determination. Captain Joey Dayon was driven in by Moe Maleh in the first inning and the team held on behind excellent defensive plays by Michael Haddad, Nathan Haddad, Shaya Tawil, Moe Maleh, and Morris Bijou. The team was led by coaches Eric Hall, Brett Beard, and Jeff Dayon who did an excellent job in preparing the team for such a close game. Notable mention to starters Michael Shalom, Joey Betesh, and Michael Tawil along with all the other members of the team. Go Falcons!! 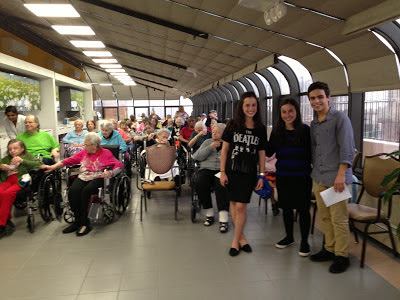 Students, Michael Zalta, Esther Bildirrici, and Aida Franco recently sang and played the piano at Shore View Nursing Home to uplift the spirits of it's residents. Thank you Mr. Ezra Hanon for arranging this special event. Recently, Yeshivah of Flatbush introduced the Harvey Bachman Internship Program in honor of long time Flatbush Director of Pupil Personnel Services, Mr. Harvey Bachman. Mrs. Ruth Waide, Director of Pupil Personnel Services at the Yeshivah of Flatbush Elementary School and Dr. Gila Sandler, Director of High School Guidance presented Mr. Bachman with plaques commemorating this event. The internship program will allow undergraduate and graduate students a special opportunity to shadow, intern, and learn from our school's exemplary guidance department both in the elementary school and high school. Mr. Bachman's long tenure at the Yeshivah coupled with his dedication and commitment to our students lent his name perfectly to this unique program. marching with local and state dignitaries. 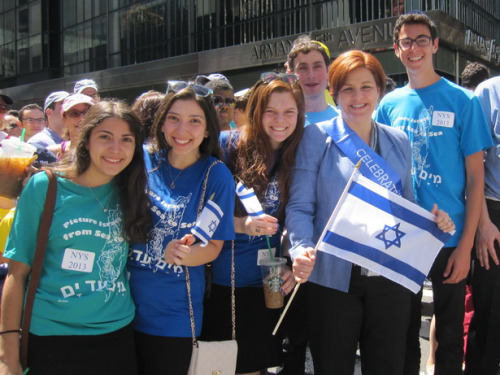 On Sunday, June 2nd our students marched down 5th Avenue in the annual Celebrate Israel Parade in support of the State of Israel. Our students wore a sea of different shades of blue, reminding us of the beautiful blue color of the different seas of Israel. "Me Yam ad Yam" is the Yeshivah of Flatbush theme, which introduces us to the different beautiful seas and beaches of the land of Israel. Our SGO and Senior Council had the honor of marching with the Governor of New York and other dignitaries form New York State and New York City. On Friday, May 31st Yeshivah of Flatbush Joel Braverman High School honored students for their academic excellence in the annual Arista: National Honors Society Induction Exercises. Students and guests also had the merit of hearing from the renown Flatbush graduate and Dan David prize recipient, Dr. Leon Wieseltier, who is currently the literary editor of The New Republic. The Arista program is a great way for us to recognize the hard work and effort our students put in over their years of high school to succeed academically. Wellness and Confidence Commission Night! On Tuesday night, May 28th, the Confidence Commission and Wellness Tzei U'lemad joined forces to launch an event like no other. The Girls Fashion Show wasn't the typical runway show; its mission was to not only allow girls to express themselves on the outside, but also to reflect on their inside. Before the show started, the girls attended sessions relating to the topic. The Wellness sessions included Yoga with Ms. Robinson and Art Therapy with Rena Grosser, a certified art and child life therapist. The first Confidence session was given by Naomi Maryles, an attorney, who spoke about balancing a career and motherhood. The second was given by Esther Hidary, a well known educator, who spoke about the power of women in Judaism and beauty in the Torah. 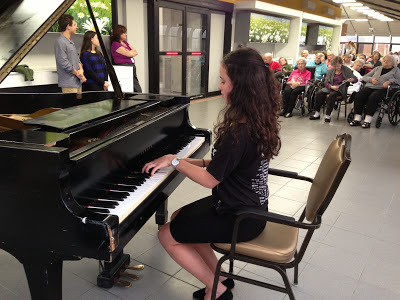 The third was given by Rina Kattan, Flatbush alum and Barnard student, on our perspective on beauty and life. After the sessions, the girls gathered in the auditorium for the runway portion of the event. The runway show was like no other. The models were asked to wear an outfit that speaks for their personality. Once the models walked down the runway and onto the stage, they turned their backs to the audience to show the sign that said "I am____" (filled in with a characteristic that they love about themselves). Each model then explained her outfit choice in relation to her personality and walked off the stage with confidence. They were shown a TED Talk given by fashion designer, Jessi Arrington, who has mastered the concept of expression through clothing in her own unique way. Afterwards, Jessi answered some of the Confidence Commission members questions via a live video feed. Our Yeshivah of Flatbush Girls Dance team also then gave a riveting performance. The night not only inspired girls to express their inner qualities through their clothing, but also inspired them to strive to be unique individuals. Family, friends and faculty who were at the program gave it rave reviews and all agreed that they can't wait for next year's event!